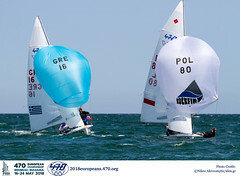 Today was the final day to make the cut through to the top 10 teams in the Mixed/Men's fleet, and the Women's fleet at the 2012 470 Junior World Championships. At Takapuna Boating Club the day began very quietly with no wind, no sun and a light drizzle of warm rain. Sailors left the shore around 1100 hours when there was a hint of a breeze and by midday the first attempt at race 11 of the twelve race series was underway. On the course today there was an unusual south southeast (SSE) wind direction for the Waitemata Harbour. This fickle light wind comes from the off the land, but with Rangitoto Island adding shelter. After rain overnight, the atmosphere was heavily humid and hot. 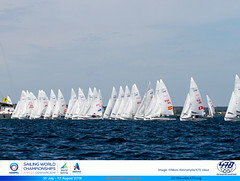 Difficult conditions for the Race Management team who had to abandon race 11 as the wind had died out. Shortly after, the decision was made to abandon racing for the day. Friday 3 February is the final day of the Championship. 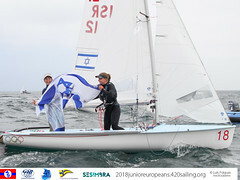 At 1100 hours those in the Mixed/Men's fleet who have not made the top ten will race their eleventh and final race of the series, at 1300 hours the Women's fleet will sail their medal race, followed at 1400 hours with the Men's fleet medal race. The forecast is for strong winds.